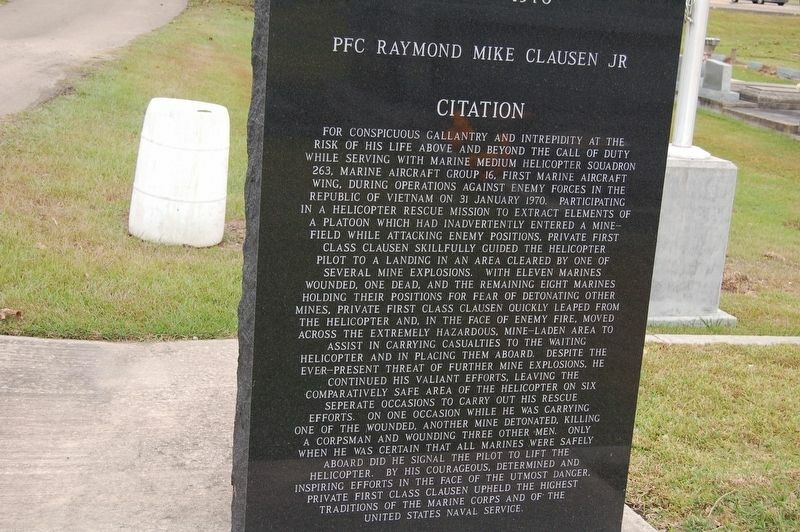 PFC Raymond “Mike” Clausen, Jr.
to carry out his rescue efforts. On one occasion while he was carrying one of the wounded, another mine detonated, killing a corpsman and wounding three other men. Only when he was certain that all Marines were safely aboard did he signal the pilot to lift the helicopter. 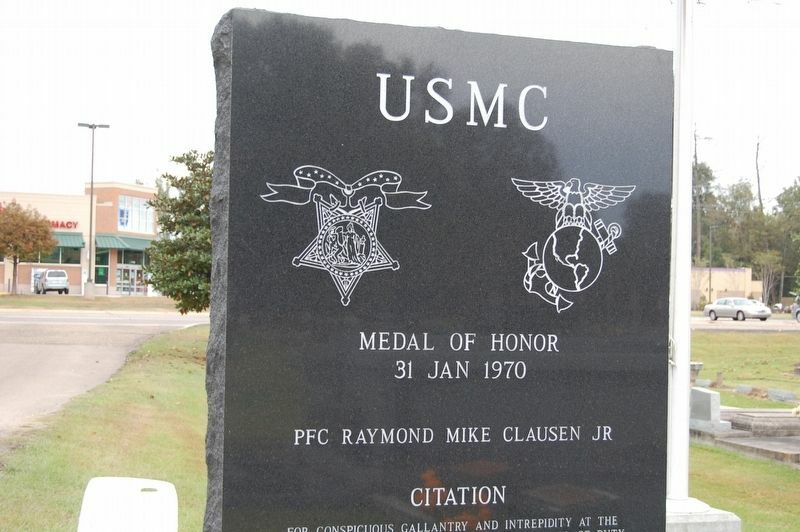 By his courageous, determined and inspiring efforts in the face of the utmost danger, Private First Class Clausen upheld the highest traditions of the Marine Corps and of the United States Naval Service. Location. 30° 26.257′ N, 90° 27.414′ W. Marker is in Ponchatoula, Louisiana, in Tangipahoa Parish. Marker is on West Pine Street (State Highway 22) near 51, on the right when traveling west. Touch for map. 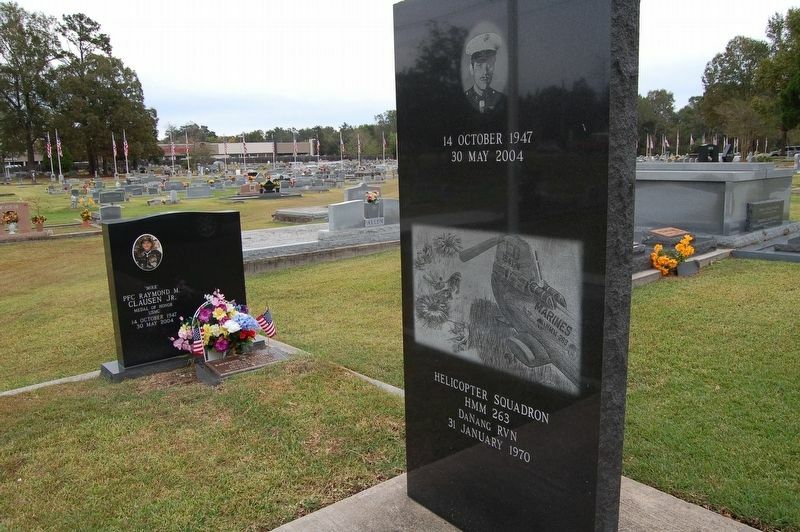 Located just inside the Ponchatoula City Cemetery. 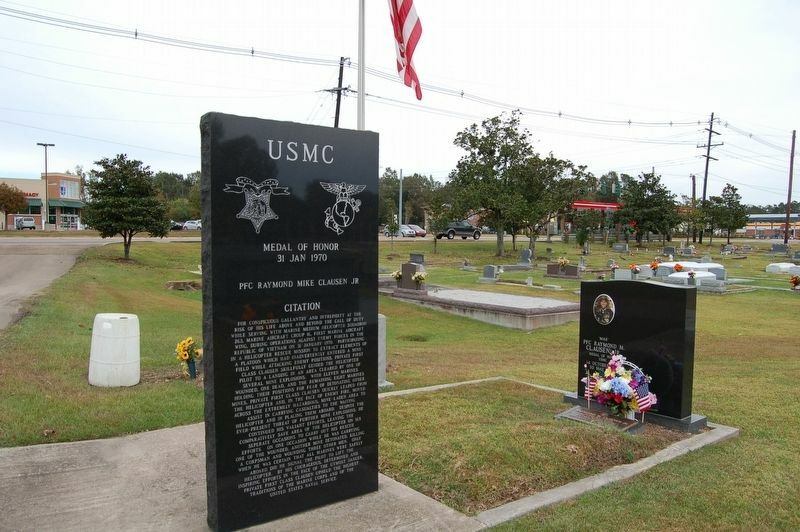 Marker is in this post office area: Ponchatoula LA 70454, United States of America. Touch for directions. (approx. 4.7 miles away); Grace Memorial Episcopal Church (approx. 4.8 miles away); City Of Hammond (approx. 4.8 miles away); Friendship Circle (approx. 5.2 miles away). Touch for a list and map of all markers in Ponchatoula. More. 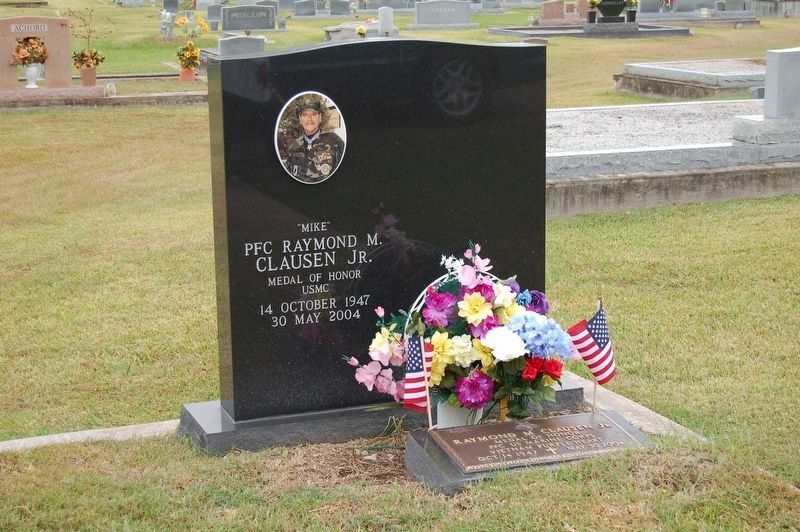 Search the internet for PFC Raymond "Mike" Clausen, Jr.. Credits. This page was last revised on November 11, 2017. This page originally submitted on November 17, 2016, by Cajun Scrambler of Assumption, Louisiana. This page has been viewed 224 times since then and 8 times this year. Photos: 1, 2, 3, 4. submitted on November 17, 2016. 5. submitted on November 17, 2016, by Cajun Scrambler of Assumption, Louisiana.